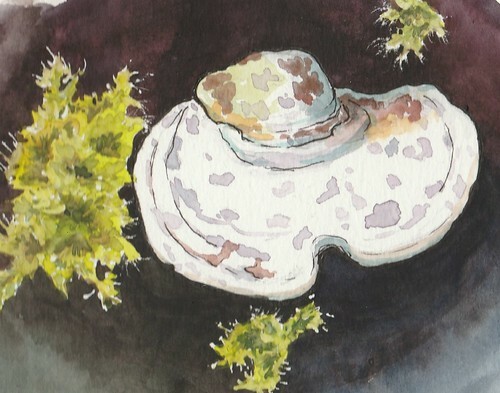 Fern Moss and Shelf Mushroom Watercolor – Let's Paint Nature! I am wearing my rain gear with layers of clothing bundled underneath as I walk on a grassy trail laced with mud. I don’t mind the mud nor do I mind the cold drizzle on my face. In a lifetime of Monday thru Friday, 9-5 numbness, the cold drizzle is a welcome. It makes me feel alive. On a particular section of trail, I find a banditry of chickadee. Their chatter is loud and overwhelming. I do not know what they are saying for I do not speak chickadian. Perhaps I am the subject of their banter, disrupting them on a day where they do not expect many humans? They unwittingly halt me in my tracks. As I stand there looking up, something tells me to look down…. At my feet, I discover another world…. 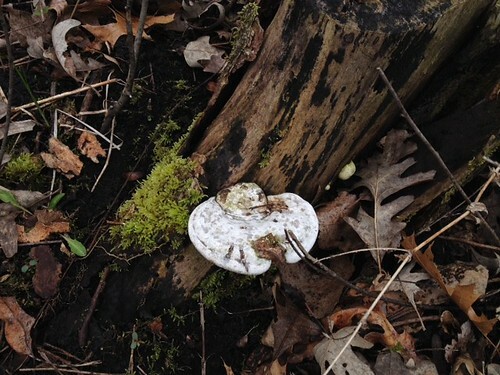 a glowing white shelf mushroom carpeted by brilliant green moss, set contrast to a dark saturated tree stump. I no longer hear the clatter of the chickadees, because I am lost in the contour of the moss. My eyes follow every fern-like curve. I observe its green gradient from dark green- to medium- to light- to white tips. The chickadees are not amused by my fern moss and mushroom rapture, so they maintain their scold. I know when I’m not welcome. I’m leaving. I’m leaving. I walk away knowing the secret of where my beauties live…..under the chant of the chickadees. It is our responsibility as artists to find what they are trying to distract you from, and paint it … or carve it … or sculpt it … write about it. You’re doing a great job fulfilling your responsibility … . Thank you for your art! Ha ha ha…raccoons of the bird world. 😀 They are feisty aren’t they? I do like sleep more though…. Are you certain it was not wrens that were chattering? I put up 4 wren homes and the chattering is pretty loud, especially at 4:30 am. Then the chicadees sing with their two note melody and it’s quite a cacophony of sounds!